How mature are your brand’s social media efforts? As greater media investments are made into social media and channels, brand’s move up in their ‘maturity’. 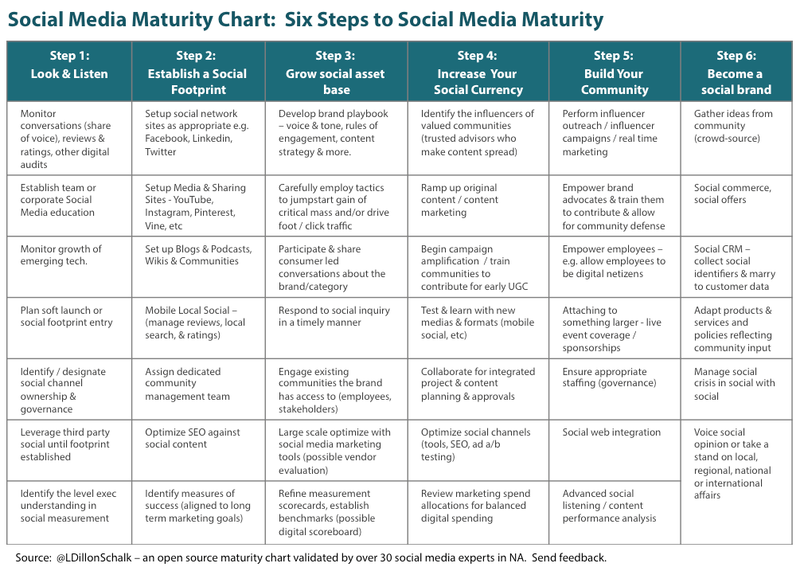 There are six major steps in social media maturity – each with a number of operational activities that create these levels of maturity. But growth can be uneven or stunted if some of the operational activities that unpin a brand’s social media maturity are missed. Having worked with many brands, I find three broad patterns that are holding organizations back in their maturity of their social media efforts. Lack of an overall strategy and structure to guide larger social brand efforts – e.g. annual content planning, channel strategy, articulated brand voice & tone, etc. Lack of alignment between key stakeholders on where the organization is today and what the priorities are for future. Missed fundamental steps which make more sophisticated efforts easier to implement. In 2012, I created a social media maturity chart with the help of @RickWolfe. I couldn’t find one in the marketplace so we worked together to introduce a maturity framework. Together we hosted a series of round table discussions (to which Rick is a master) to roadtest this chart among experts in social media as well as experts in marketing. In the end, over 30 experts helped validate this chart – making it an open sourced framework for anyone to use & modify. I’ve always asked people to send their feedback on its use. Perhaps the coolest thing about this chart is that it was my first ‘pin’ – as in first time one of my pieces of work, via this blog, was pinned by someone else. Long story short – my blog post was re-shared on twitter recently and so it was time to share an updated chart. Thanks to @zapache for the prompting. This entry was posted in social networks on August 21, 2015 by Laurie Dillon Schalk.